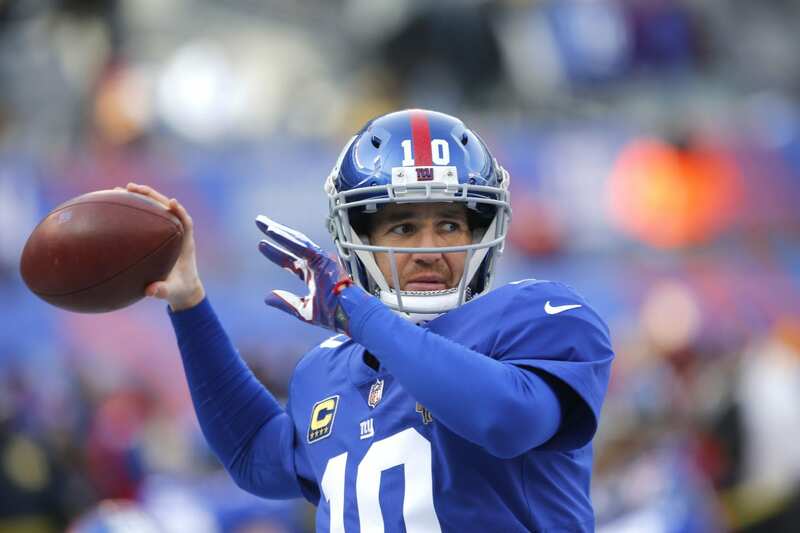 The jury is out on whether New York Giants veteran quarterback Eli Manning can continue performing at a professional level. Legendary defensive lineman Osi Umenyiora seems to believe that the Giants’ signal-caller still has plenty of gas left in the tank. Umenyiora enjoyed a nine-year career in the NFL, seven of which he spent with the Giants, winning two Super Bowls in the process. He’s spent plenty of time with Manning, learning his tendencies and skill-set on the offensive side of the ball. Ultimately, it comes down to the productiveness of the offensive line and its ability to protect Manning. Giving the veteran time to move through his progressions is the key to success, and we saw last year that he can, in fact, still make a majority of the throws — more-so intermediate than deep balls. The acquisition of left tackle Nate Solder and the drafting of Will Hernandez has certainly helped the left side of the line develop, while the right still has several question marks. The prolonged consistency of Jamon Brown and Chad Wheeler at right tackle represent concerns. I anticipate the Giants finding a replacement for Wheeler this offseason whether it be through the draft or free agency. Solving the puzzle on the right side and the return of center Jon Halapaio should offer a much better line for Manning to work behind. Additionally, if the Giants choose to draft a rookie quarterback they will need to ensure they can protect their successor. Putting a young quarterback in a Josh Rosen situation where he’s running for his life on every play could be destructive to his development. Personally, I think Manning is still capable but he requires a lot to achieve success. Good receivers, a great offensive line, a generational running back…if he can’t succeed, it would be incredibly disheartening. It will likely be Manning’s final season as the Giants quarterback, given he fails to run the offense to perfection. If a passer is drafted I would expect the 2019 season to be his last, but if Osi is right, Manning might be able to get Big Blue to the playoffs for the first time since 2016.